Scientific Metaphysics is an inquiry into the nature of Reality and the science of being. This inquiry includes exploring the fundamental nature of human being, what makes each of us unique – and what’s present when we, as human beings, show up. The dimension of self-discovering that occurs inside the study of Scientific Metaphysics has you live with peace, joy, and full self-expression. The Institute of Metaphysical Science offers regular seminars, workshops, discussions and open houses that explore the many areas of metaphysical science and ways to apply this thinking in our daily lives. Join with us in the inquiry! Get your free copy of We Are the World We Walk Through by Margaret Laird! Just pay for shipping. Enter code WATWgiveaway at checkout. We’ll also share additional information about Scientific Metaphysics and upcoming events offered by the Institute. There’s just one thing going on. Mind is the source and condition of all existence. Man is the expression of God being. There is but one I, or Us, but one divine Principle, or Mind, governing all existence. Opposites are unknown to Mind. Moment by moment Mind is disclosing its infinitude, seen as old things passing away and all things made new. Science marks the end of the belief that man exists humanly now to become divine later. Without man as conscious identity, the word God has no meaning. Our classes & events will help you go deeper in your understanding of Metaphysical Science and explore its application in your daily life. Explore Science at your own pace with our Metaphysical Science self-study course, which includes 24 hours of DVD learning. Discover a treasure trove of Science books and audio in our store. Delve into the intuitions of reality unfolding from your own divine withinness. Like other forward-thinkers willing to follow wherever the premise ALL IS MIND led her, Margaret Laird found herself propelled into the fast currents of modern thought to produce Christian Science Re-Explored, the most important presentation of Metaphysical Science since Mary Baker Eddy's day. 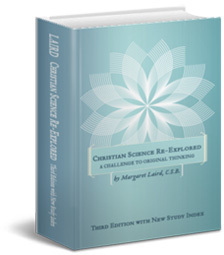 Published in 1965, Christian Science Re-Explored was written from Mrs. Laird's personal and spiritual experience. Copies are available in the IMS Shop. This free monthly event is open to all inquiries on Scientific Metaphysics, so bring your questions and join us for a lively discussion. All you need to participate is a phone!